Where does one find OUR (WMGS) blog?? A blog (a truncation of the expression weblog) is a discussion or informational site published on the World Wide Web consisting of discrete entries (“posts”) typically displayed in reverse chronological order (the most recent post appears first). Until 2009, blogs were usually the work of a single individual, occasionally of a small group, and often covered a single subject. More recently, “multi-author blogs” (MABs) have developed, with posts written by large numbers of authors and professionally edited. MABs from newspapers, other media outlets, universities, think tanks, advocacy groups, and similar institutions account for an increasing quantity of blog traffic. The rise of Twitter and other “microblogging” systems helps integrate MABs and single-author blogs into societal newstreams. Blog can also be used as a verb, meaning to maintain or add content to a blog. Quick answer – Sort of like a family chain letter. Families used them pre-Internet. You read the letter, respond on the bottom and send it to your next sibling who sends it to the next sibling – etc. A blog is couple sentences or a long article (which ever you want to write) about any subject. 1st: Lets respond to a post. Fill in the information directly and click Leave comment -OR- use your own text editor (i.e. MS Word) in another window and write your response. When you’re satisfied, copy and paste your response here. 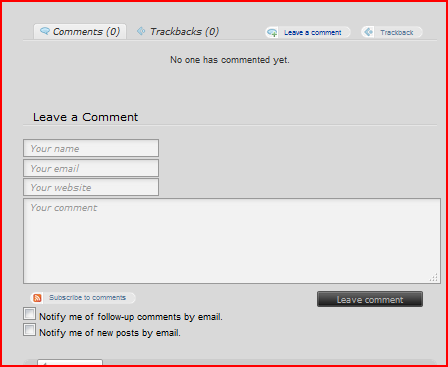 Your response will be reviewed by the blog owner – to be sure it’s an actual comment – not spam or bad language. After it is approved, your comment will be visible to other readers. 2nd Let’s write a post to be added to the WMGS blog. Write your few sentences, paragraphs, or article. Be sure to add pictures if you can. 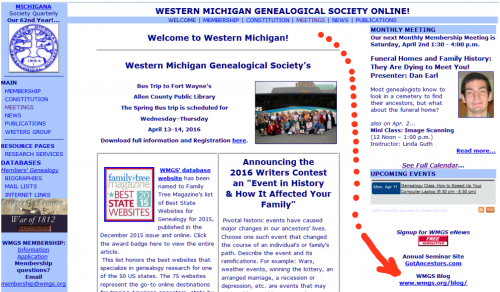 Topics for the WMGS blog should be related to those of interest to fellow members, genealogists or historians. Example: I had a great time on the WMGS bus trip to the Allen County Public Library. I can’t wait to go again in the fall. This time I will spend more time preparing. I could have done much more if I’d written down the call numbers instead of just the book titles! I wrote this in the text portion of an email. I addressed the email to webmaster@wmgs.org. In the subject of the email I wrote “blog post”. SEND. That’s it. I could have attached a word document to the email which for longer posts works more easily. Thanks Sue! Now maybe I’ll actually get started.